Enter Our Cruise Chicago Photo Contest! Share your photos taken aboard a Chicago's First Lady Cruises or Mercury, Chicago's Skyline Cruiseline vessel for the chance to win a private yacht outing for six, two-night stay at The Peninsula Chicago, a dinner at City Winery and more! 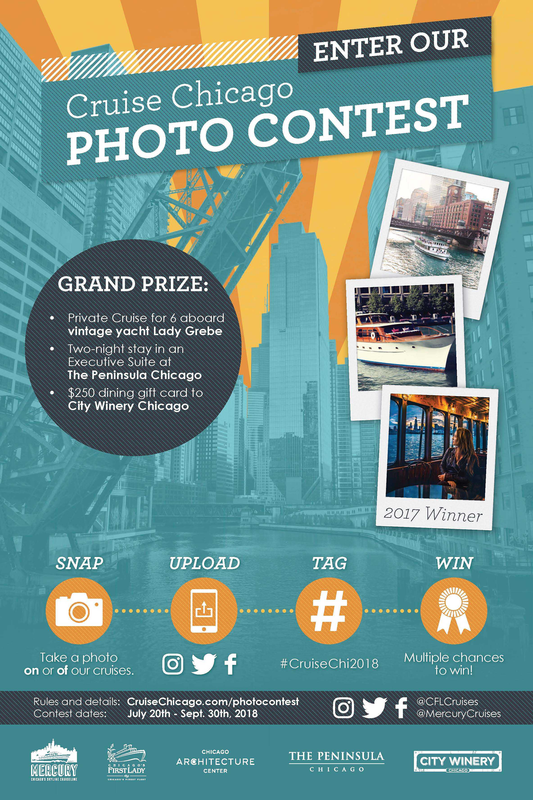 Cruise aboard a Chicago's First Lady Cruises or Mercury, Chicago's Skyline Cruiseline vessel, snap a photo and enter for chance to win! Photos only accepted for those taken during contest entry dates. 4. WIN! Multiple chances to win prizes! • Private Cruise for six (6) aboard vintage yacht Lady Grebe. Includes picnic basket and beverages. • Two-night stay in an Executive Suite at The Peninsula Chicago. The spacious Executive Suite has stunning views including large picture windows. The living room offers a sofa, lounge chair, tablet technology, and vanity dressing table. The master bedroom features a king bed, custom Pratesi linens, bedside charging for all smartphones and an en-suite marble bathroom with soaking tub. • $250 Dining Gift Card to City Winery's West Loop facility. City Winery offers Chicago's only urban winery along with a intimate 300-seat concert venue, outdoor wine garden, a spacious restaurant and private event space. Featuring a selection of house-made scones, finger sandwiches and pastries, Afternoon Tea at The Peninsula Chicago has become a local favorite and an attraction among visitors since the hotel opened. While the menu changes seasonally, guests will find such selections on the menu as: traditional scones, almond financier, lemon meringue macarons, raspberry rose cream puffs, chocolate crumble tarts, asparagus & truffle quiche, and lobster salad, smoked salmon and cucumber tea sandwiches . The recipient of this prize will receive Afternoon Tea for two. Well-known as Chicago’s premier “Chocolate Bar” in The Peninsula’s Lobby every Friday and Saturday evening from 7:00 pm to 11:00 pm, Executive Pastry Chef and Chocolate Sommelier Dimitri Fayard offers guests a veritable buffet feast of elegant bite-sized chocolate desserts and morsels. Winners of this prize will receive “Chocolate Bar” for two. A new lounge inspired by the world's cultural and culinary riches. Z Bar's innovative hand-crafted cocktails and cuisine showcase bold global flavors, while curated live music, art and design create an immersive atmosphere. Featuring iconic views of the city, the rooftop terrace is an ideal perch to experience Chicago's wonders. Z Bar embodies the jet-setter's search for surprise, adventure and a taste of luxury.